Sometimes, a game can feel like a bit of a chore. Lemonade Tycoon and a few of Kairosoft’s app store releases began to give me that feeling towards the end of their gameplay, and I’m beginning to get it again with Draw Something, but for completely different reasons. Whereas the former can require a little too much waiting and watching, Draw Something sometimes feels a little too much like a social obligation. Whilst that factor has been instrumental in its success, there’s a risk that it’ll also contribute towards its downfall. 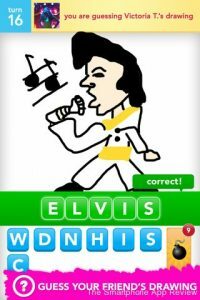 For those that haven’t played it, Draw Something is like a virtual version of Pictionary. You choose a word from a list of three and draw it whilst someone else tries to figure out what you’re drawing. All they’ve got to go by is your drawing and a scrambled selection of letters. As soon as they’ve guessed the word, it’s their turn to draw and your turn to guess. Cleverly, you don’t both need to be online at the same time to play. Rather, the entirety of your drawing process is recorded and replayed to your fellow scribbler so that they can guess what you’re drawing as you draw it, mistakes and all. You then get the chance to watch them guessing what you were drawing before you guess what they’ve drawn. 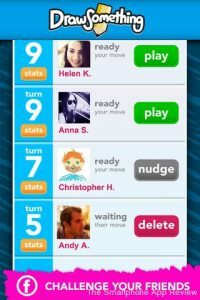 The gameplay is amusing because you’re playing against friends – the app connects to Facebook. Yet, this personal touch also adds pressure to the game. The main menu is a list of the people that you’re playing with. If you don’t draw for a fellow player for a few days, they have the option to ‘nudge’ you into action. I’ve never used the option myself, nor has anyone used it to spur me into action, but its very presence suggests that you’re in the wrong if you don’t consistently respond to friend’s drawings within a day or two. The whole game is geared towards making you play regularly. The thing is, the more you play the game, the quicker you realise how little there is to it. Being short on cash, I’ve been playing the free, ad-supported version. This version has 2000 fewer words than the paid version of the game, a potentially good incentive to upgrade. Many people will trial the free version of the game before spending any money on it. Yet, I initially found that the free version had enough content to be entertaining, so I wasn’t inclined to pay for more. However, over time I’ve become so used to the words available that I’ve begun to become able to predict what’s being drawn by quickly unscrambling the available letters. Yesterday, my friend had barely had time to begin colouring the screen in blue before I’d guessed that they were drawing ‘shark’. Because of this, I’ve become less attached to the game as I’ve played it more, and no longer feel any incentive at all to spend what little money I have on it. So I’ve grown away from the game. Add to that the element of social obligation – not letting friends down by making sure that you draw for them promptly once they’ve done the same for you – and it boils down to being a system whereby you’re being pressured into slavishly drawing words you’ve drawn before, then guessing words you can predict. That’s how I see it, anyway. Of course, I could always spend money on the game, but I feel no desire to. I’m not enjoying the game enough to spend money on it. I feel as if I’ve already got the best of the experience, so why pay for it now? drawings, there’s less reason for you to play. If you stop drawing as often, friends will have less reason to play. If you play frequently, you’ll become overly familiar with the word choice and so feel less inclined to play. The game has become popular because of its social gameplay model, and could lose its popularity for exactly the same reason. I really like the game but being in the same vein as Words With Friends, it definitely needed some improvements. This new update is definitely what I was longing for – the ability to comment, undo last function, etc. I’ll keep playing as long as they keep making it interesting. Fair enough 🙂 Whilst I’d say the update’s definitely brought about a few much-needed improvements, I still can’t see myself sticking with it for much longer, sadly. It’s too little, too late for me.